27th Nov 2018 in General, Special offers! We can feel the beautiful, shimmering festive season is approaching. This Christmas we would like to offer our loyal customers Christmas presents from Villeroy & Boch tableware. 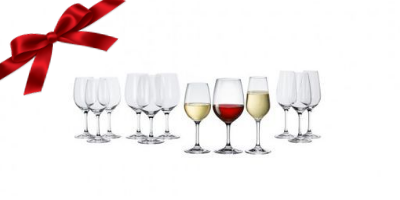 The sparkling Villeroy & Boch crystal glasses will complete your Christmas party. 4 x Red wine goblets, 4 x White wine goblets and 4 x Champagne flutes. The item will not display as a product in your basket, we will dispatch one with your order. The promotion starts on 27th November 2018 and ends on 31st December 2018. UK Bathrooms reserves the right to withdraw or change the promotion at any time before the end of the promotion period. The offer only applies to an order made online. The offer does not extend to quotes, price matches or trade accounts. If the order is more than £500, the customer will receive a free V&B Entrée crystal glass set. The offer is limited to one free V&B glass set per order. Transit damage to promotional items is not covered, there are no replacements offered for damaged promotional items. The promotional item must be returned if the order is cancelled and returned to us. The promotion items are limited, on a first come first served basis. Once the stock is depleted the offer will end.